It was a different animated world that greeted G.I. Joe fans when the animation house DiC took over the reigns of the property in 1989. The series returned after a year hiatus with new episodes that not only featured a different quality of animation but also a nearly completely overhauled cast. DiC---“Do it Cheap” as the company was mocking called by industry insiders. After an initial mini-series that tried to bridge the gap between the Sunbow-animated G.I. Joe: the Movie and this new era, the first season debuted with a heavy emphasis on the 1990 G.I. Joe roster. 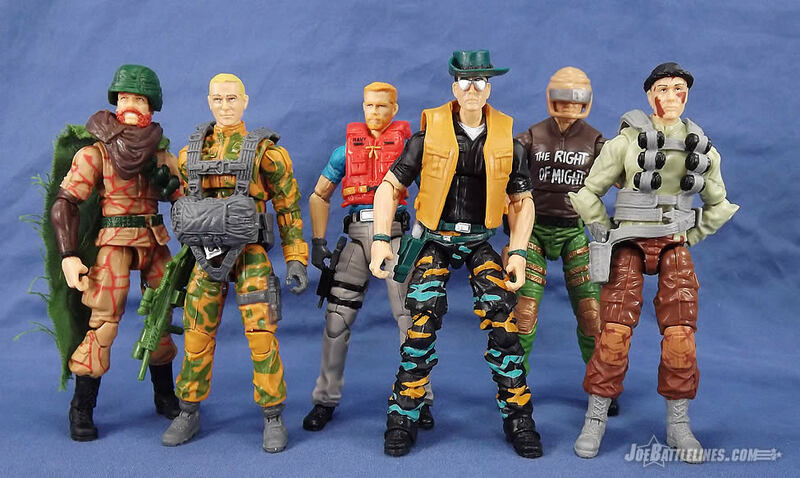 While old favorites like Flint, Gung-Ho, Roadblock, and Shipwreck were out, it was a new crop of Joes that were tasked with taking the fight to Cobra. Among this new group was a sideburn-wearing concealment specialist from the town of Walnut, California. 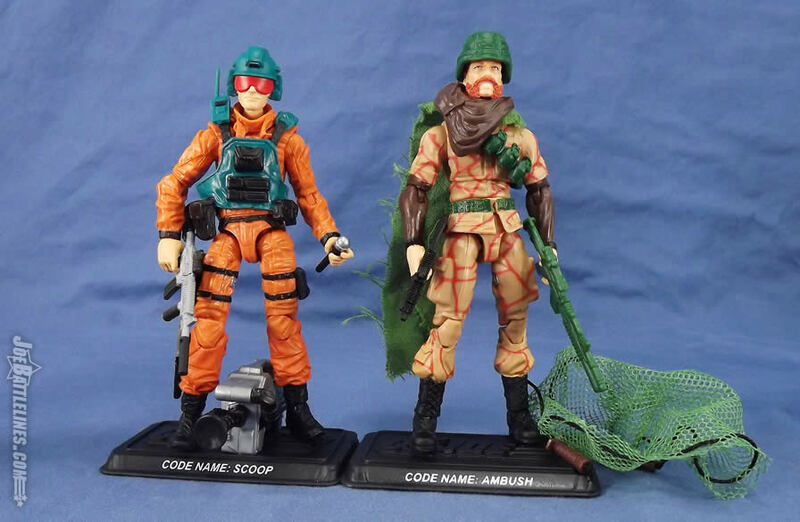 Joe fans, meet the modern construction update of Ambush! It’s a fairly functional build that manages to emulate the original body design fairly well, considering that the Club put exactly zero dollars into new tooling for this figure. Let’s emphasis that: ZERO dollars. “DiC”. 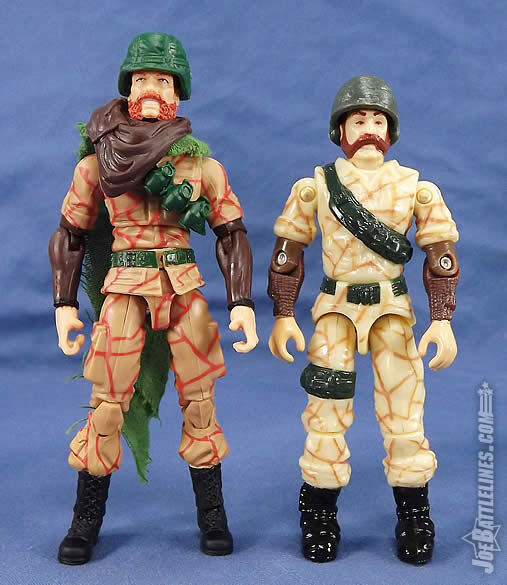 The Dusty torso is fairly close to what Ambush wore in his debut appearance. 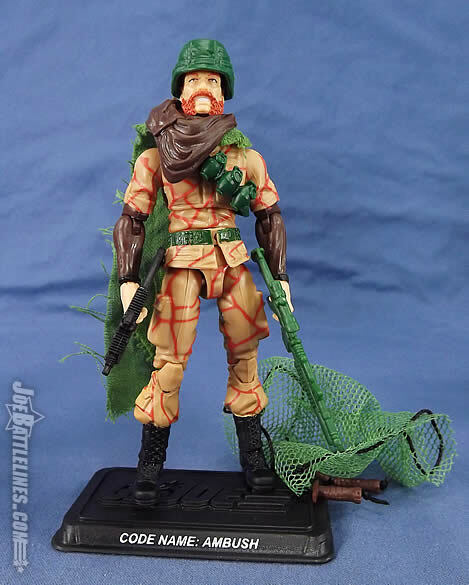 The same goes for the legs-- Ambush’s uniform was nondescript enough that the Club is able to use the 25th Anniversary era tooling and get away with decent resemblance to the source material. Only the Colton arms throw the basic body design off in any significant fashion. The original Ambush figure was wearing what appeared to be a henley-style shirt under his uniform top. The Club recreated the color scheme on the Colton arms but not the texture. 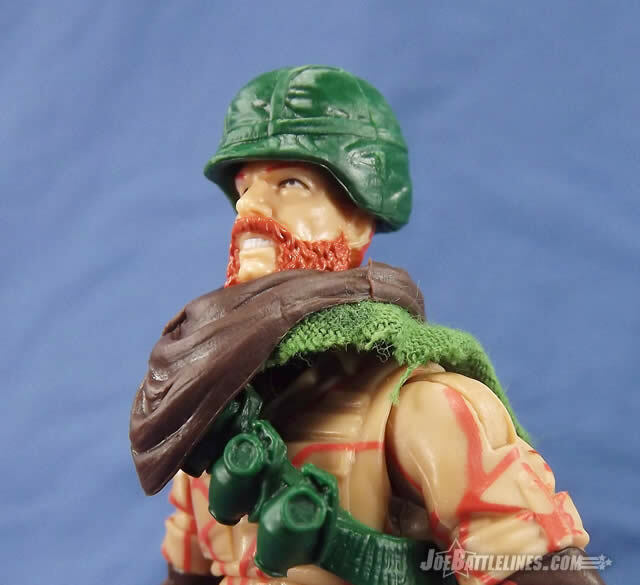 The forearms of the Retaliation-era body are smooth which gives the appearance that Ambush is almost wearing spandex under his shirt. It looks a bit odd and the darker color gives the impression that his arms are actually longer than they appear to be. The arms were a poor choice, given there are other lower arms that would have worked much better---like the Dollar General Shipwreck arms. The fabric still would have been tight fitting, but it would have the extra ribbing detail that could have added more detail to the figure. This one’s kind of a head scratcher for me. The original Ambush’s design was built on a tan camouflage-patterned uniform with a dark brown shirt underneath. Fairly simple and straightforward in execution. 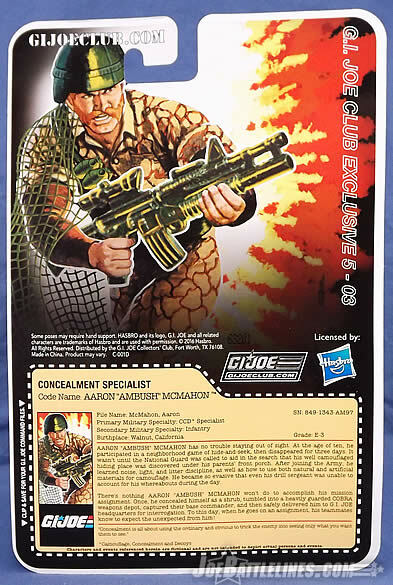 For the FSS version, the Club seems to have varied from their usual strict adherence to the vintage stylings and instead opted for a darker uniform-- with a red camouflage pattern. That’s right-- the lines on the uniform are printed in a reddish-orange hue that closer to Spearhead than the original Ambush. 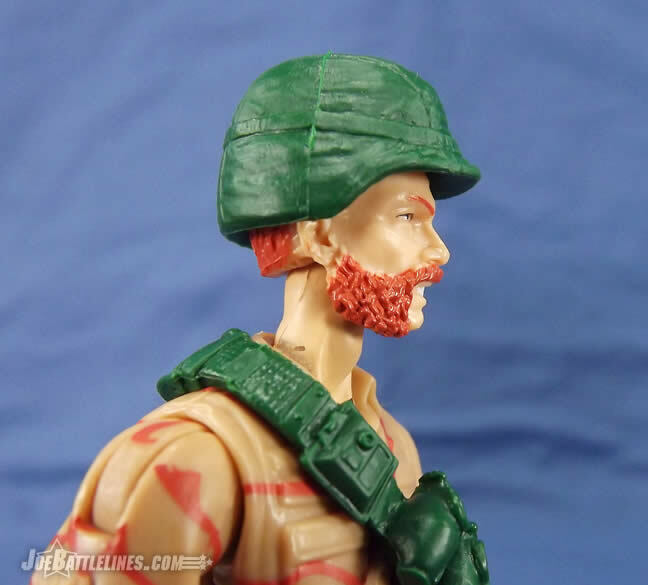 It’s almost as if the Club took the colors from the character’s beard and decided that his BDU’s should color coordinated with his hair color. The end result is that his battle togs don’t resemble any type of camouflage so much as they emulate the color scheme of a giraffe. Seriously. I just don’t get it. Yup. 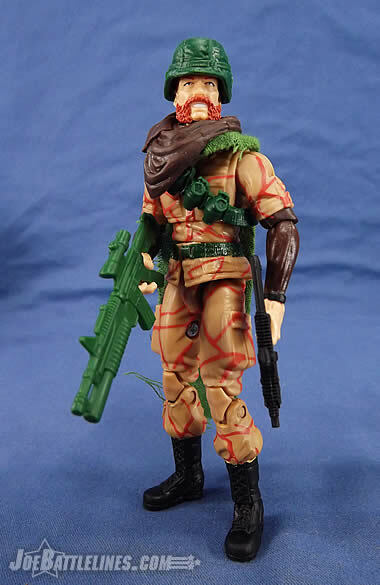 The original figure had a sort of reverse “giraffe” camo, possibly based off of the WWII German Afrika Korps tank camo, or perhaps the British SAS 44th Paratrooper Brigade’s unique pattern---or possibly even from something else. The Club’s take on it is not as patternized as the vintage one. It looks cheaper and boring, so it looses some of the aesthetic it originally had back in the 80’s. But by itself it’s not a deal breaker, as it’s similar enough to get by. 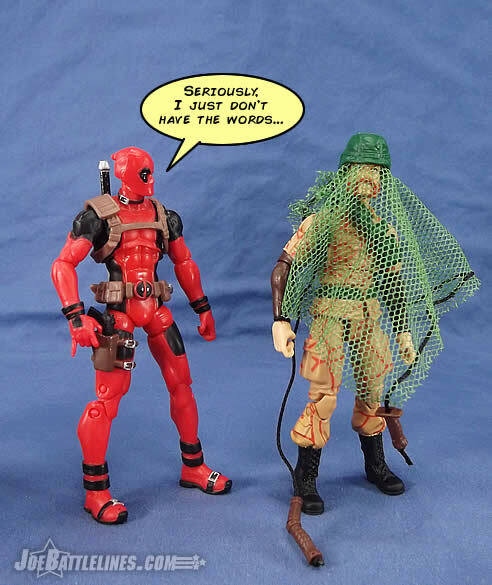 Back in 2015, the Club released the “Peril in Paradise” convention set that featured the G.I. Joe Tiger Force taking on a group of MARS troops. These villainous forces were led by General Mayhem, a character whose origins go back to the 2005 convention set! 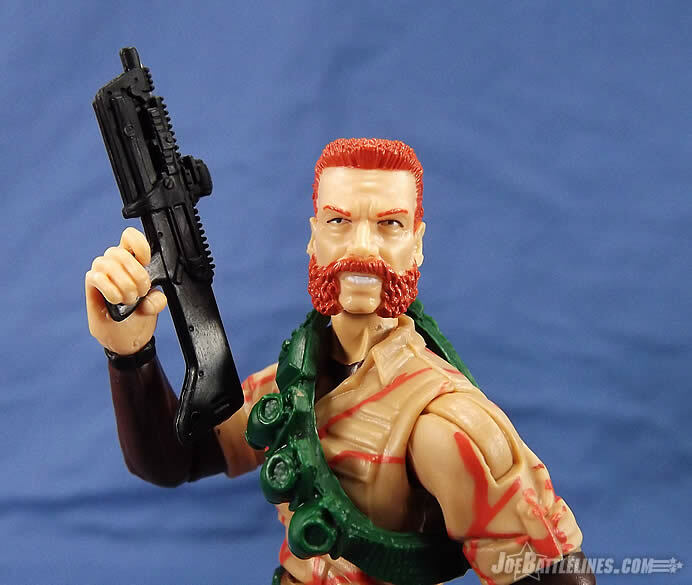 The GIJCC developed a brand new head sculpt for the 2015 General Mayhem figure the displayed a look of both arrogance and aggression befitting the enemy commander. 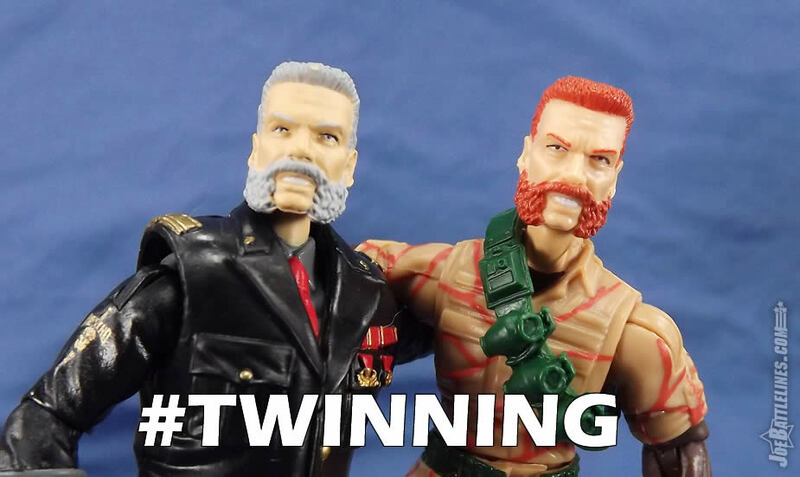 Fans have come to expect one thing from the Club of late---no new head sculpt goes without a reuse! Or ten reuses. (In fact, character likenesses are becoming blurred so that the Club can use the same tooling for more than one release anymore but that’s another story.) Rather than give Ambush a brand new noggin’ of his own, the Club elected to reuse the Mayhem head---to mixed results. To be fair, it works. It was probably always supposed to be Ambush, as General Mayhem was bald in his original incarnation. First off, the head is a bit large for the body, giving Ambush very top-heavy appearance. Secondly, the head is a very poor fit for the torso used-- to the point that Ambush’s neck is about twice as long as it needs to be. (Remember the giraffe comment from earlier? It’s coming back to bite poor Ambush in the keester.) In fact, the head sits so high on the neck that the Club tried to cover it up by given our Concealment Specialist the neck scarf from the PoC Dusty figure to cover it up! The result is less than successfully and actually seems to draw more attention to poor Giraffe Boy’s deformity than it does to divert attention away. Indeed. 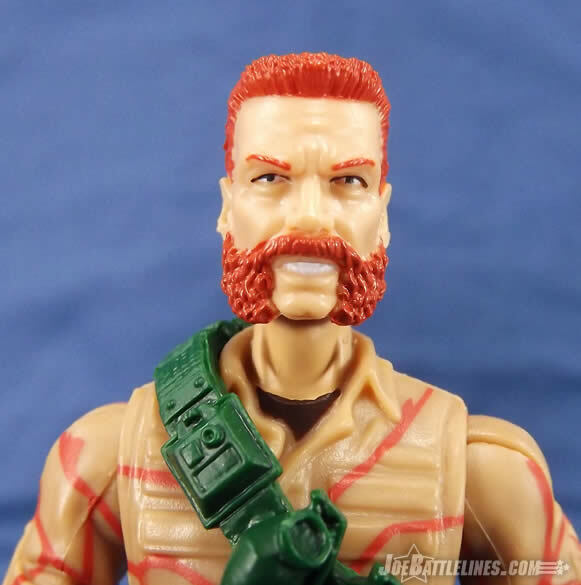 The head sculpt is fine, and I think we all knew it would be recycled for Ambush. But holy moly, what poor body proportionally-challenged hack decided this torso was the best fit?! Lastly, the Club changed Ambush’s hair color from brown to red. Now, in every appearance I’ve researched (both comic and cartoon) Ambush had brown hair. Suddenly, after growing an elongated neck he’s decided that he’s a ginger. Combine that with the fact that the figure’s countenance just doesn’t look very heroic and the result is a disappointing parts reuse that merely served to save the Club money. Maybe I’ve been hanging out with Chris too long but color me EXTREMELY disappointed in the result. The rifle and shotgun do a decent job of recreating the original Ambush’s load-out fairly well. 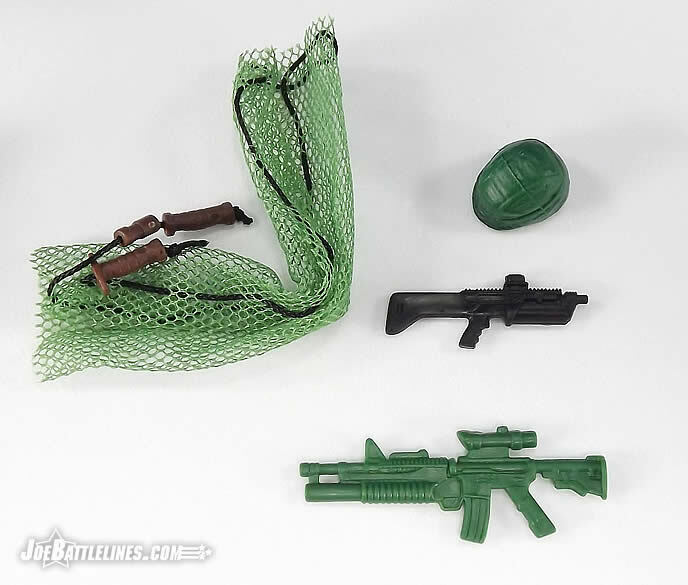 Instead of the grossly oversized British L-85 he originally came with, the Club opted for the green M4 which fits fairly well into the figure’s hands. This is one rare case where I do not mind the weapon being non-black. The green looks good. The KSG, originally included with PoC Dusty, is a fair match for the grenade launcher that was included back in 1990. 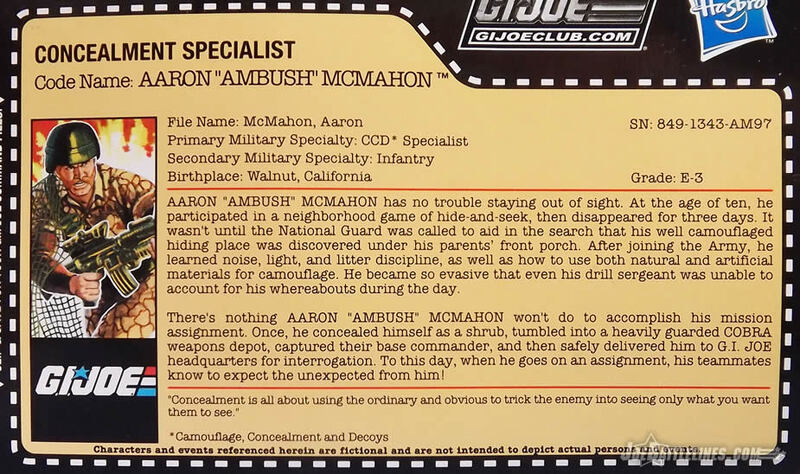 However, those are just the icing on the cake as we’re all looking forward to Ambush’s updated lean-to, right? Let’s be honest-- the Club is working with limited dollars when it comes to a production budget. They’re not Hasbro and therefore newly-tooled parts are going to be few and far between. So, instead of a lean-to, Ambush comes back with a net. That’s right---a mesh net. In fact, it’s the same net that was included with the PoC Shadow Tracker. There are no poles, no backpack, nothing that can be used to turn it into anything other than a net. 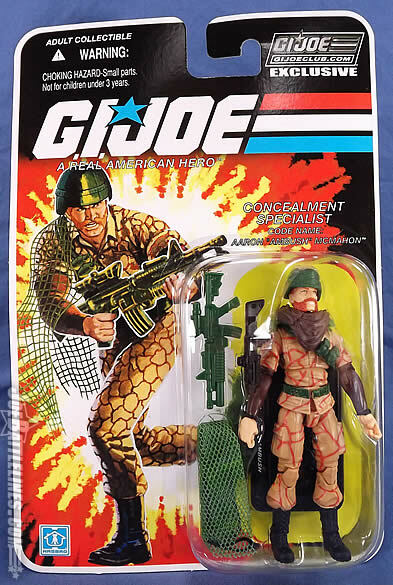 There’s not even a hole cut into that would allow Ambush to wear it as a ghillie suit. 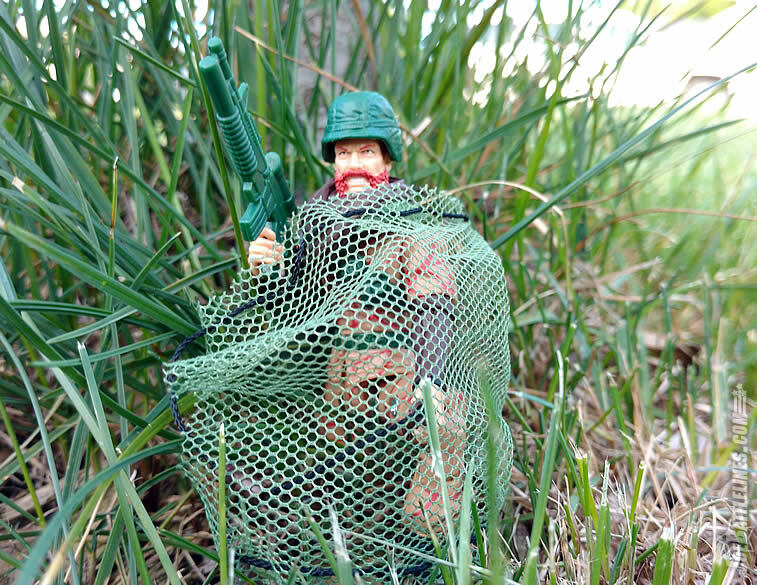 (Nevermind we have a dedicated ghillie suit from Spy Troops that could have worked…) I don’t know-- maybe he’s supposed to catch someone else and steal their gear with this? At this point, it’s just best not to think about what might have been and move on. 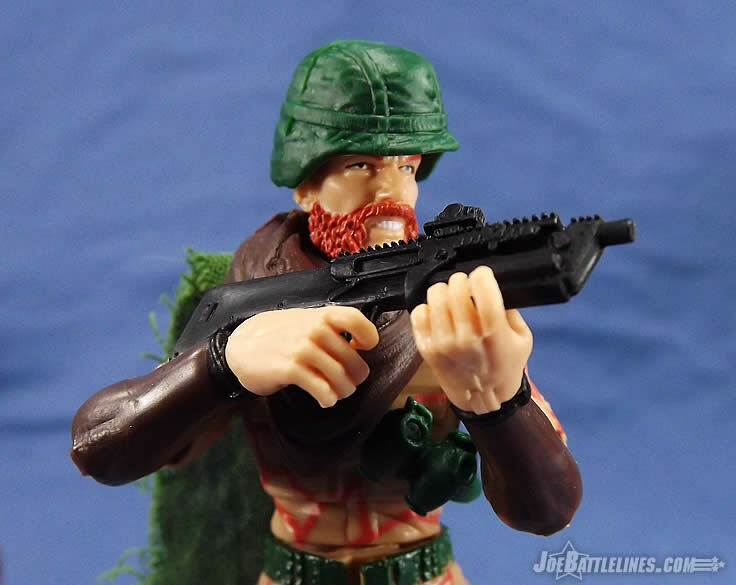 At the end of the day, is the FSS Ambush worth adding to your G.I. Joe collection? Let me preface my answer with a few comments. 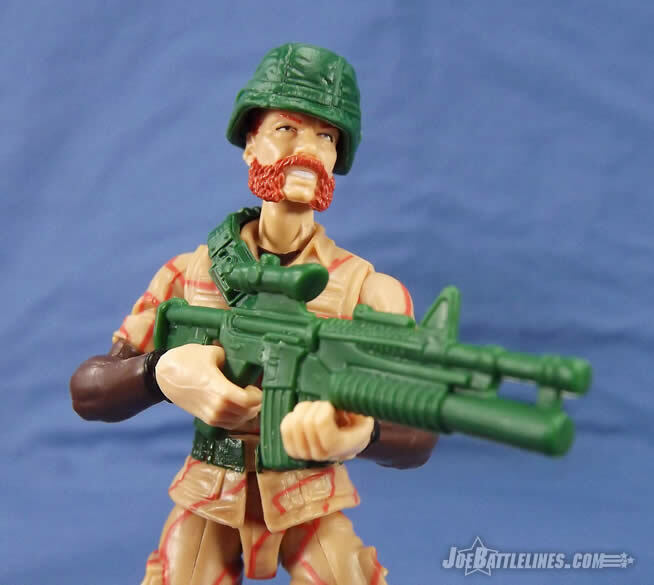 I have zero nostalgic attachment to the character as I was pretty much out of G.I. Joe by the time he debuted back in 1990. His appearances in the Marvel Comics series were few and far between and the bulk of those centered around him driving the Battle Wagon. Or getting shot in his first appearance (or close-to-first appearance) along with Recoil. As such, I have to judge this character by what’s presented here and how it compares to the vintage original. By that criteria, I have to say that Ambush is a pass for all but the most die-hard DiC-era fans out there. I wanted to like this figure but the combination of oddly colors, neck issues, and odd accessory choices convey the impression of a hastily-assembled custom as opposed to a well thought out design. Ambush feels phoned in-- like the Club knew that they had to fill 12 slots and decided that this build was low hanging fruit thanks to the Mayhem head. The result is a figure that just doesn’t feel like the heroic concealment specialist that used to pal around with Scoop and Pathfinder. Instead, I’m left with the impression of “General Mayhem, the younger years” or Giraffe Boy, star of the Weekly World News. Unless you really want Ambush in your 0collection, save your cash and skip this one. I agree. If Ambush had an alternative torso with a properly sized neck, I’d say he was ok----not great, but not terrible. 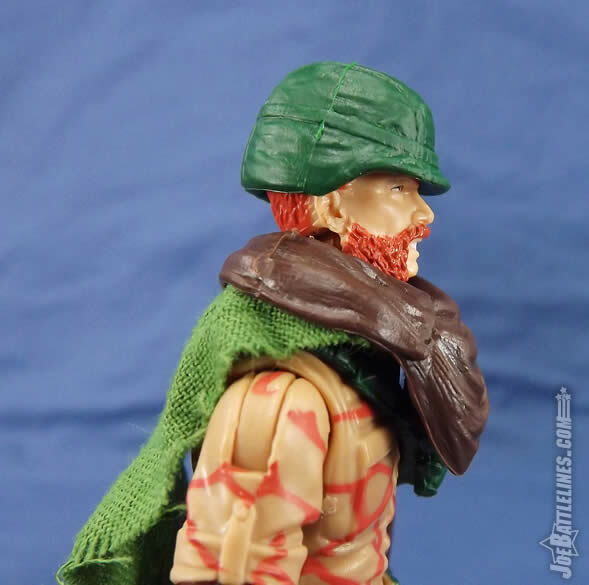 But this He-Man-inspired Mekaneck-look critically ruins the figure’s aesthetics making him a dud for all but the most ardent fans to possess. In this case the Club worked backwards from the head, and opted for the cheapest, easiest parts they could do without any mental lifting. With no new tooling and inflated shipping charges in which the Club pockets the difference, this figure is not worth it’s price tag. The Bottom Line: Ambush is a mix of parts and accessories that should work and yet fail to come together in any meaningful fashion. So close and yet so far from being worth the purchase.